Help us enrich and curate heritage AV materials! 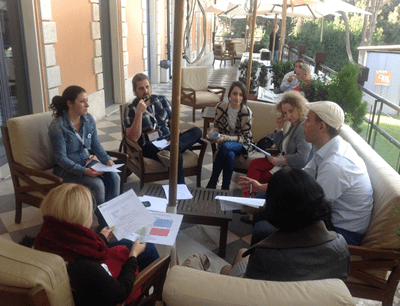 At the EUscreenXL conference in Rome, between inspiring talks, innovative projects and some sparks of Dolce Vita in Villa Borghese, people also participated in a workshop on Contextualization, which focused specifically on the question how AV contextualization practices can benefit best from the affordances of online publication. AV contextualization practices are a key part of the EUscreenXL project, reflected, amongst others, in an open access multi-media journal VIEW: Journal of European Television History and Culture and the EUscreen virtual exhibitions. Although several tools are currently being developed to explore and analyse digital audio-visual sources (AV), this workshop mainly focused on the next step: how to contextualize and re-use audio-visual materials online. This activity is part of our endeavours to build a ‘contextualization community’, in the sense of a community of content providers, creators, archivists, scholars, researchers, students and the general audience, who would work and explore the audio-visual material offered on euscreen.eu. Our Core Collection will consist of ca. 60.000 historical items gathered from the audio-visual cultural heritage of 22 European countries. The purposes of the ‘contextualization community’ that we aim to achieve are to enrich and curate such content, as well as to experiment with other creative forms of online multimedia publication. 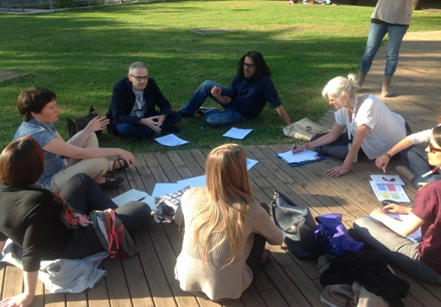 To this regard, during the workshop in Rome, possible scenarios and prototypes of contextualization strategies were introduced by the workgroup leaders, Berber Hagedoorn (Utrecht University / Luxembourg University), Willemien Sanders (Utrecht University), Mariana Salgado (Aalto University) and Daniel Ockeloen (Noterik BV). Participants then tested and challenged these models stimulating a critical discussion regarding possible (hybrid) models of online publication with AV content. In particular, participants were asked to reflect on meaningful forms of use of publication, drawing upon examples from their own practice. The task was to exchange experiences in contextualization practices and to choose one that better represents what they would like to see realized on the EUscreen portal. As a result, participants proposed various strategic combinations of publication models and dissemination purposes, which could actively involve users, as well as encourage them to widely spread and share the audio-visual contents. Indeed, they explored innovative ways of doing research through audio-visual materials, and they suggested engaging dissemination strategies which could be appealing not only for academics but also for broader audiences. Moreover, from the workgroup discussion it emerged a hierarchy for the possible functionalities of the publication builder. In particular, three building blocks were seen as necessary elements: 1) translations and quick subtitling that contextualize and explain the AV content in different languages; 2) video collections represented in video posters, as a creative combination of video and/or sound; and 3) extra short videos, which are videos of max. 15 seconds used to illustrate a specific point. This last building block would be handy especially for dissemination purposes, since it could spread content via social media and mobile phone applications in order to engage the users on cross-media platforms. There was a general consensus on how contextualization processes are interweaved with strategic dissemination purposes. In addition to these building blocks, participants emphasized the interest in certain recurrent topics that could engage general audience, such as food and fun clips. Thanks to the contribution of every participant we gained useful insights and ideas regarding future developments of our ‘contextualization community’ as well as the EUscreenXL publication builder, our next step. Certainly, we are always eager to receive further feedback and suggestions from all of you! If you are keen on exploring innovative forms of multimedia publication, or if you are interested in enriching and curate AV historical contents, we would love to consult you and your contribution will be highly appreciated. Share your ideas for future developments!